I'm excited to participate in Rebecca's simple things photo challenge! This photo is full of so many little things that make me smile. A relaxing Sunday morning playing in our jammies (albeit mismatched on Logan's part due to an accident). 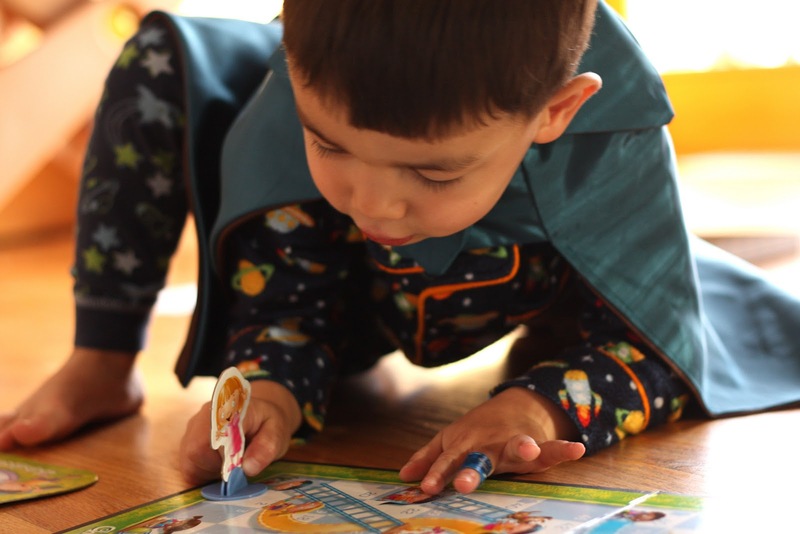 Logan decided to don the superhero cape I got him for his birthday while we were playing Chutes and Ladders. He won (for real - no throwing the game on my part) but immediately after this photo he moved my character to the finish spot as well so we could both win. LOVE that. LOVE this guy. If you want to participate in the simple things photo challenge, click here! such an adorable, everyday photo! :) love it1! The bright sunlight bouncing off the wood floors gives this shot the perfect Sunday glow. Love it! Love it! So I've got Candyland down, but how do you throw the game in Chutes and Ladders? That game can take forever sometimes, lol! I love the band aid. :) The look of concentration is awesome!